The Eden Monarch is a large greenhouse that allows you the flexibility to grow a variety of different plants. It also has enough space for a small table and chairs from where you can enjoy your greenhouse in comfort. One big advantage of the Monarch is that there is no door lip which makes it ideal for wheelchair and wheelbarrow access. The wide double-hinged door is also very high and can be opened from both sides. It can also be locked. The Monarch, in either a mill or a green finish, has an integral base which makes it easy to assemble. It has additional side and roof bracing for added strength. You can choose between three different glazing options - 3mm horticultural glass, 3mm toughened glass and 6mm polycarbonate. Dont confuse this greenhouse with low specification 'cheapies' made to a price - this greenhouse is built to withstand the harshest weather and to last for years and years. 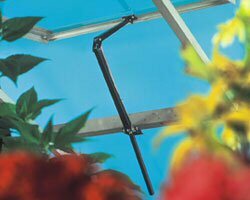 The Monarch is easy to erect and includes generously-sized roof vents. An easy-assemble base plinth is included to make installation of the greenhouse even easier by eliminating the need for a bricks-and-mortar base plinth. Eden is one of the UKs longest-established greenhouse manufacturers, and has an enviable reputation for quality and value. 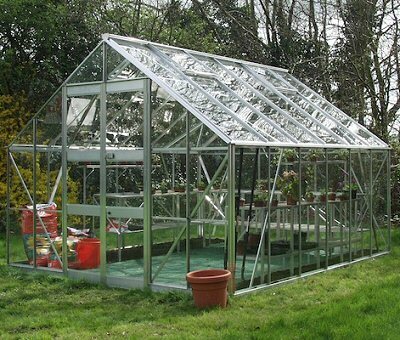 All Eden greenhouses are supplied in kit form and are manufactured in maintenance free aluminium. Using the step by step fully illustrated instructions, assembly is an enjoyable weekend project. The frame simply bolts together and the pre-cut glazing easily slots into place and is clipped to hold. All our Eden Greenhouses come wth a 12 year frame guarantee covering both workmanship and material. This greenhouse is designed to be assembled by you. We send comprehensive instructions, which are easy to follow. Our Monarch range comes with three glazing options. 3mm Horticultural Glass (standard 3mm floatglass traditionally used in greenhouses), 3mm Toughened Safety Glass (toughened to British Standard BS6206 for extra safety), and 4mm Twinwall UV-stabilised clear polycarbonate for good light refraction, high insulation and added safety. Don't confuse these greenhouses with low specification 'cheapies' made to a price - these greenhouses are built to withstand the harshest weather and to last for years and years. They are outstandingly easy to erect and includes a generously-sized roof vent. An easy-assemble galvanised steel perimeter base plinth, with integral anchor points, is available to make installation of these greenhouses even easier by eliminating the need for a bricks-and-mortar base plinth.Eden is one of the UK's longest-established greenhouse manufacturers, and has an enviable reputation for quality and value. 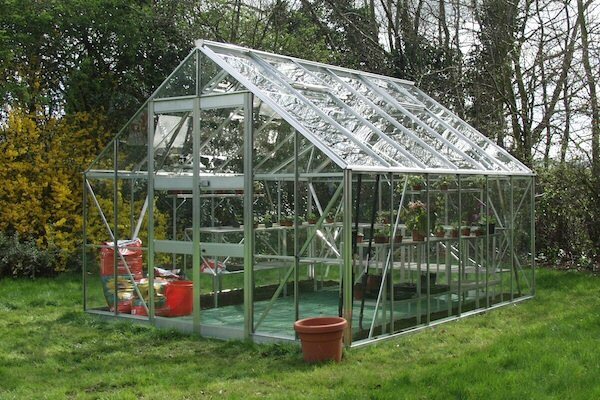 All Eden greenhouses are supplied in kit form and are manufactured in maintenance free aluminium. Using the step by step fully illustrated instructions, assembly is an enjoyable weekend project. The frame simply bolts together and the pre-cut glazing easily slots into place and is clipped to hold. All our Eden Greenhouses come wth a 12 year frame guarantee covering both workmanship and material. Either order online (both secure online card payment or cheque/bank transfer payments available) or telephone us to place your order. Delivery times are usually 14-21 days, although there are times of the year when this may extend slightly. Once you have made your order you will receive confirmation by post and email. You will then be contacted to arrange delivery (and installation if required) on a day that suits you.